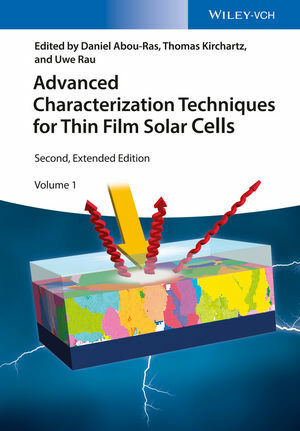 The book focuses on advanced characterization methods for thin-film solar cells that have proven their relevance both for academic and corporate photovoltaic research and development. After an introduction to thin-film photovoltaics, highly experienced experts report on device and materials characterization methods such as electroluminescence analysis, capacitance spectroscopy, and various microscopy methods. In the final part of the book simulation techniques are presented which are used for ab-initio calculations of relevant semiconductors and for device simulations in 1D, 2D and 3D. Building on a proven concept, this new edition also covers thermography, transient optoelectronic methods, and absorption and photocurrent spectroscopy. Daniel Abou-Ras is senior scientist at the Helmholtz Center Berlin for Materials and Energy, Germany. He obtained his PhD at ETH Zurich, Switzerland. In 2005, he was awarded the MRS Graduate Student Gold Award at the MRS Spring Meeting. His research interests are correlative approaches in scanning as well as transmission electron microscopy, mainly applied on semiconductor devices. Technology at the University Duisburg-Essen and head of the Division for Organic and Hybrid Solar Cells at the Institute of Energy and Climate Research 5 ? Photovoltaics at the Research Center Jülich, Germany. Previously he was Junior Research Fellow in the Department of Physics at Imperial College London, UK. He obtained his degree in Electrical Engineering and Information Technology from the University of Stuttgart, Germany, in 2006 and his PhD from the RWTH Aachen, Germany, in 2009. Uwe Rau is full professor at the Faculty Electrical Engineering and Computer Science of the RWTH Aachen, Germany, since 2007 and head of the Institute of Energy and Climate Research 5 ? Photovoltaics at the Research Center Jülich, Germany. He obtained his PhD 1991 from the University Tübingen and was scientific group leader from 1995?2007 at the Universities of Bayreuth and Stuttgart. How Does a Scanning Near-Field Optical Microscope Work?